Oxygen Service is a design feature or production process which is offered on some measurement devices which make it possible to measure pure Oxygen or use in environments containing dangerous concentrations of Oxygen. Oxygen clean sensors & instruments which have sensor cells that are dry or filled with a halocarbon oil fill, and can be used in areas where there is a risk that the device will be exposed to high levels of pure Oxygen. 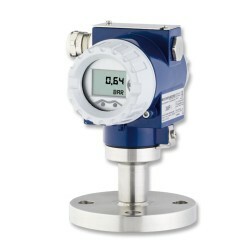 The components of the measurement device which will come into contact with Oxygen gas must be free of hydrocarbons, such as grease or oil, which might ignite when mixed with a high purity O2 gas. If there are any fluid filled components such as a oil fill behind a thin isolation diaphragm, the oil should be of such a type, which will not burn when exposed to an ignition source in an Oxygen environment, e.g. Halocarbon oil. The level of cleaning can vary from one measurement device manufacturer to another, and for more stringent requirements it maybe necessary to use a Oxygen cleaning service specialist which has a cleaning process that conforms to the relevant ASTM (American Society for Testing and Materials) standard. Send us your enquiry for a product associated with this Oxygen Service page, and get assistance with selecting a product for your application.